Members of the Vietnamese team celebrate after the final match. Competing with 19 teams from 18 countries and territories, the Vietnamese team brought home their third championship trophy from the Asia-Pacific Broadcasting Union’s (ABU) Robot Contest in Malaysia Sunday. The Vietnamese team met the Japanese in quarter-final round of the 5th annual Contest in Malaysia on Sunday. Both were the best-scored teams in the preliminary round so the match promised to be very exciting. The objective of the round was to have robots produce a re-construction of Kuala Lumpur’s twin towers using polystyrene builder blocks. Each team was equipped with a squad of builder robots and a support team of blocker robots who defend from the opposing teams offenders who try to interfere with the building. 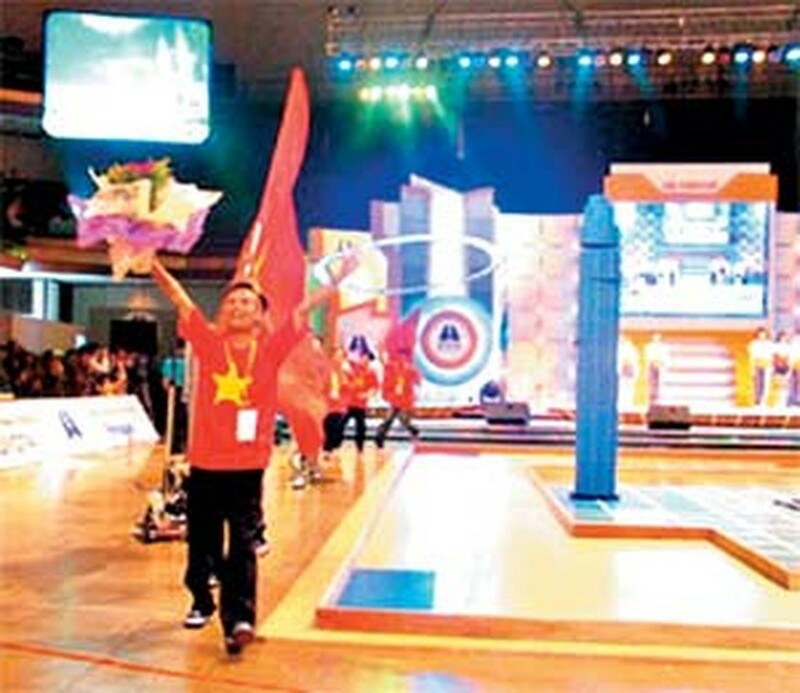 With faster robots, the Vietnamese team thrashed the Japanese team 12-3 to go into the final. “The Vietnamese team’s blocking robots are good and fast. We tried our best but could not stop them from scoring” admitted a member of the Japanese team after the match. Formerly, the Vietnamese dismissed the Fiji team in a 24 – 2 win using 2 robots named “Love Angel.” The Vietnamese also cruised to an easy 17 – 5 victory over the Korean team. They then met the Malaysians the semi-final round. The robots appeared to be at equal strength but the Vietnamese’s appropriated clever strategies lead them to a 15 – 10 to advance to the final round. Ultimately, the Vietnamese team defeated the Thais in the final with a stunning 24 – 11 victory to complete their ABU Robot Contest championship hat-trick. The 8 members of the Vietnamese team are students at the Ho Chi Minh City University of Technology. They are 2 final-year students studying electrical engineering, 3 juniors studying mechanics, 2 juniors studying electrical engineering, and 1 fourth-year student also studying electrical engineering. There were 19 teams from 18 countries and territories, including Bangladesh, Brunei, China, Egypt, Fiji, Hong Kong, India, Indonesia, Japan, Korea, Macau, Malaysia, Mongol, Nepal, Saudi Arabia, Sri Lanka, Thailand and Viet Nam. After sailing to sweet victory, the champions were awarded US$12,500 by the Ho Chi Minh City Committee of the Party, US$1,250 by the Support Fund for Young Talent and a “Creative Youth” medal by the Central of the Ho Chi Minh City Communist Youth Union.